The hotel is located in Tirana's main boulevard, close to the Ministry of Finance, the Presidential Palace and all major embassies. This hotel is the center of meetings for the world 's affairs, politics and art. 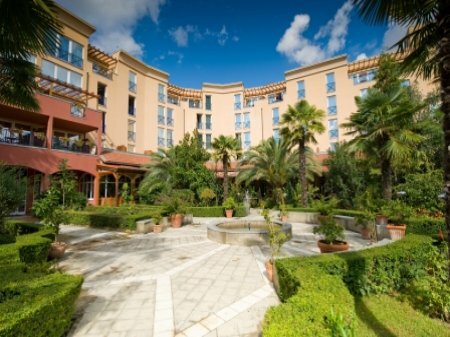 In addition to the excellent facilities and the perfect service, customers will find a friendly atmosphere in a wonderful and unique Mediterranean garden in the city of Tirana and the highest safety standards. The "Apollonia" restaurant offers international, Albanian and Austrian cuisine.The hotel has 7 conference rooms with perfect equipment and a team of professionals that will make your event unforgettable. After a day of work, you can relax in the outdoor pool or enjoy a delicious cocktail at the bar by the swimming pool or at the bar "Pirro".